The following diagram represents the right triangle along with their legs and hypotenuse. 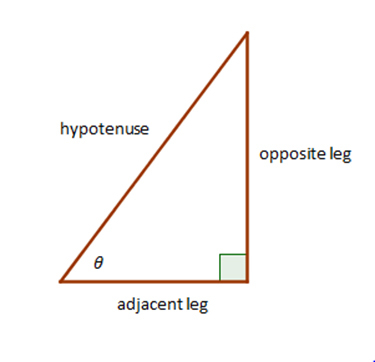 Letting the figure from the definition be our guide, we see that the adjacent leg is \(12\) and the hypotenuse is \(20\). Then it’s as easy as plugging in the numbers. So in this example, \(\cos C \approx 0.6000\). 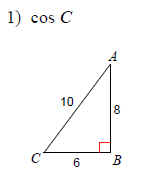 Example: Find the value of \(\cos A\) to the nearest ten thousandth. So it is important when finding trigonometric ratios to remember to determine correctly which leg is the opposite, which is the adjacent, and which is the hypotenuse. After that, it’s as easy as plug ‘n’ chug! Find the value of each trigonometric ratio to the nearest ten-thousandth. 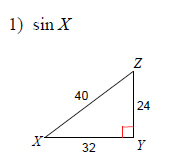 Find the value of each trigonometric ratio.